The Economist has seen fit to lend its sole obituary in the latest issue to Brian Haw, “peace campaigner,” who died on June 18th. 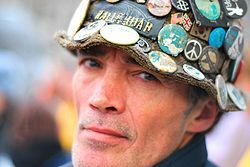 For ten years, he camped outside the British Parliament in protest of his country’s wars abroad. At first, the onetime evangelist was considered, by the likes of Tony Blair, something of a welcome curiosity. Then they realized he was serious. The authorities soon got tired of him, though. Westminster Council tried to remove him because he was a nuisance and “obstructing the pavement”. It failed. By 2005 Tony decided he’d had enough of the name-calling. The Serious Organised Crime and Police Act said Mr Haw had to give six days’ notice, if you please, of any demonstration within a kilometre of Parliament. How could he do that? The High Court ruled against it, and said he was legal. But the police never acted as though he was. Any morning they might wake him up with a siren, whoop, whoop, Are you there Brian, yank up his plastic, rifle through his private property right in front of Parliament. Who was abusing whom then? In 2006 78 of them came to tear down his wall of pictures, smashed it, trashed it, left it like a bomb site. Left him with one sign. He stayed, of course. “The prophet has no honor in his own country” is proverbial, and we’re at least thankful such men get some positive press like this, here. Muchas gracias amigos.